ALL YOU NEED TO KNOW ABOUT FRYING ZUCCHINI BLOSSOMS. As zucchini plants grow, they produce zucchini flowers. These flowers are the edible blossoms that will eventually become zucchinis, if left to grow in a garden. Zucchini flowers are delicately soft and taste faintly of zucchini. Many gardeners enjoy harvesting and eating these colorful, golden blooms. Zucchini flowers can be picked from the garden and used in salads, sautéed or battered or stuffed**SEE COOK'S NOTE** and deep fried for a tasty summer delicacy. 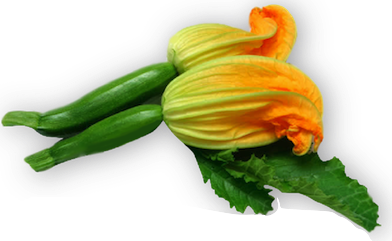 If you are lucky and don’t mind using a future mature zucchini, you can use a female blossom**SEE COOK'S NOTE** with a tiny two to three inch maturing zucchini developing on the stem end of the flower. Although the male blossom is usually used, the zucchini plants produce so profusely that frying up some very young ones is a very tasty diversion from the norm. zucchini a andle so to speak. petals and remove the pollen-covered pistil inside (that's the yellow tube-shaped part). At times it can be quite bitter. as garlic powder,  onion powder,  cumin,  fenugreek,  allspice can also be added to the batter. Mix well. 5. Remove the zucchini blossoms from the ice water and pat dry. 6. Dip the blossoms in the batter mixture. Allow excess batter to drip back into the bowl. 7. Fry in hot oil until the batter is golden brown on both sides. 8. Place on paper towels to drain. Season with salt and pepper, if desired. Serve warm. 1. Zucchini blossoms can be stuffed with cheeses, herbs and even anchovies before deep frying. and are often used to dress a meal or to garnish the cooked fruit. blossoms to propagate the squash. or tempura (after dipping the blossom in a light tempura batter), stuffed, sautéed, baked, or used in soups. ◼  FETA CHEESE STUFFED ZUCCHINI BLOSSOMS - A Greek cheese stuffed zucchini flower! ◼  FRIED ZUCCHINI BLOSSOMS STUFFED WITH RICOTTA CHEESE -  SICILIAN APPETIZER! ◼  MOZZARELLA AND ANCHOVY STUFFED ZUCCHINI BLOSSOMS - Anchovies give this treat a new dimension! NOTE: A COUPLE OF VIDEOS ON FRYING ZUCCHINI BLOSSOMS. THE VIDEO(S) BELOW MIGHT BE OF HELP TO YOU.